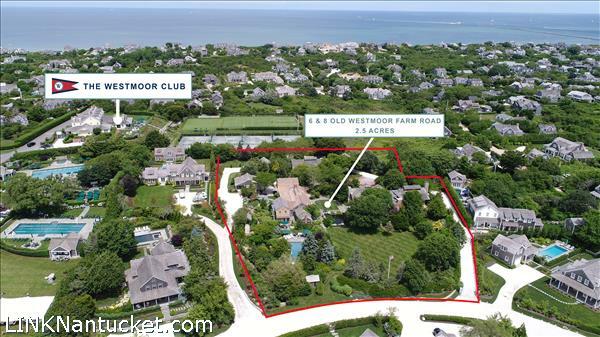 Directly abutting The Westmoor Club, this 2.5+ acre property sits at the heart of one of Nantucket\’s most coveted neighborhoods. The Old Westmoor Farm Road enclave sits just over a mile from historic downtown and nearby Cliff area beaches, bike paths and walking trails through conservation land. Three residential buildings, entertainment “barn”, two car garage, gazebo, pool and several areas for outdoor dining and entertaining adorn the estate. From the entry hall, follow the stairs to the 2017-built master bedroom suite with walk-in closet and bathroom with tiled floor, dual vanities, glass-enclosed shower and soaking tub. On the southern wing of the house, a second staircase leads to a bedroom with four twin beds. A third staircase provides access to bedroom suite which can also be reached via an exterior ship\’s ladder. ROSE COTTAGE is a 3-bedroom home built into the side of a hill affording ground-level access to each of the structures two stories. Leave your car in the driveway and enter the kitchen from the front porch. Bedroom with full bathroom and the first of the cottage\’s two living rooms complete this level. The lower level, accessible from the estate\’s courtyard, offers two bedrooms, two full bathrooms and large living room with vaulted ceiling and wood stove for enjoyment in all seasons.